Checking equine digital pulses is an important horse management tool. It can help you identify pain or inflammation in horse hooves or determine if there are possibly larger issues affecting the horse. When taking pulses, you are feeling the blood flowing through the artery going into the hooves. 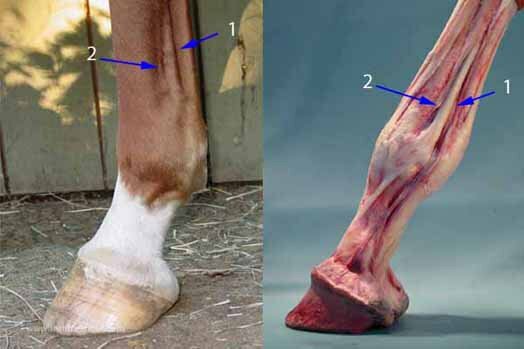 If there is inflammation in the hoof, then the blood flow is restricted and backs up in the artery. The more inflammation there is in the hoof; the stronger the pulse. In a healthy horse, equine digital pulses are relatively hard to find (because there is very little blood restriction). If you are just learning, you may assume you are not taking them properly. As long as you are in the correct area of the leg, then a hard to find, faint pulse is a good sign. Faint digital pulses are normal and usually indicate there are no major issues in the hoof. There is some natural variation in pulse strength. All horses are different, so checking pulses frequently will help you learn your horse’s normal. 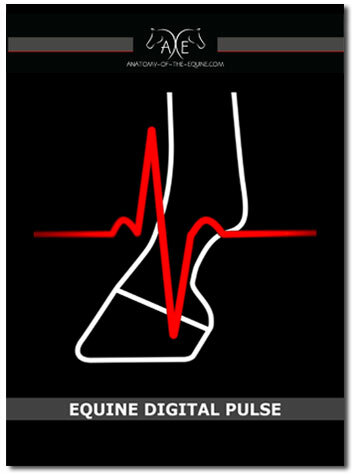 An easily felt equine digital pulse is commonly called a bounding digital pulse. The sensation is like a throbbing headache or an injured finger. It is not an increase in speed, but instead an increase in strength. A bounding equine digital pulse is a red flag. It is telling you that your horse may have a health issue. Slightly stronger is not as alarming as very strong. If the pulse seems stronger than normal, make sure to check a few times before assuming something is wrong. Stronger pulses indicate inflammation and/or pain. Compare pulses in all four feet. This way, abnormalities in one hoof will be more apparent. Which foot has the strong pulse? If there is a bounding pulse in only one hoof, then suspect a localized issue, possibly an abscess or maybe a bruise. More than likely this is a pain response to an injury. Stronger pulses in two or four feet indicate possibly a bigger problem. Your horse may have laminitis. Before you panic, look at your horse carefully. If he appears normal, happy and comfortable, then it may be a common variation in his pulses. If, on the other hand, you are noticing foot discomfort, personality changes or anything that leads you to believe he is not doing well, then suspect laminitis. The strength of the pulse and your horse’s behavior will help you determine what you should do. Strong bounding digital pulses and hoof sensitivity are often the first signs of laminitis. If the conditions causing inflammation are addressed quickly, the horse should improve rapidly with very few complications. This is why taking pulses is such a useful management tool. If the horse looks miserable or you are overly alarmed, call your veterinarian. Use your common sense. Trust your horse and your instincts. Learn to take digital pulses before there is a problem. It is funny how different it is to do something verses teach it. I have taken digital pulses for years and never have really thought about how I did it. I scoured the Internet to see what was out there and found very few pictures clearly showing how to take pulses. I put this information together in a way that would help me if I were learning without hands on help. Normal equine digital pulses can be very hard to detect. If you know the anatomy of the lower leg, it will help immensely. If you are touching the correct area of the leg and having a hard time finding the pulse, then more than likely, the pulse is normal. There are two noticeable grooves in the lower leg. 1.) 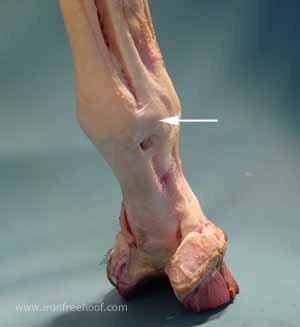 Between the flexor tendons and suspensory ligament. 2.) Between the cannon bone and suspensory ligament. The veins, Arteries and Nerves (VAN) are bundled together. When you take the digital pulse, it is blood flowing through the artery that you feel. The VAN then jumps over the ligament that covers the sesamoids and goes down the pastern. Here is a photo showing the ligament. It is the collateral sesamoidean ligament. 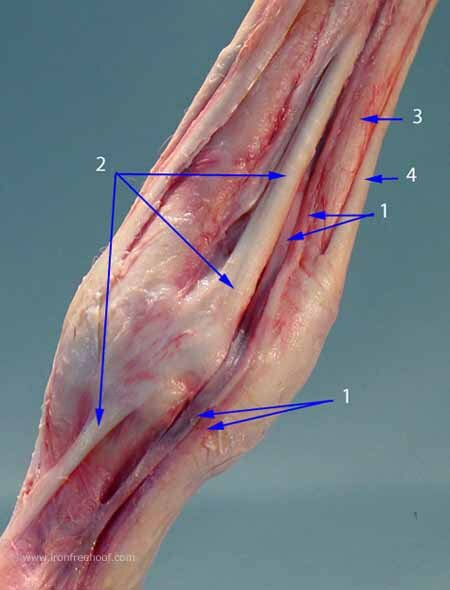 extensors branches of the suspensory ligament (2). The ligament will be much harder and towards the front of the leg. I have asked many professionals to show me how they take digital pulses and have found that everyone has a favorite region on the leg. 4 areas were the most popular for finding the pulses. If you are comfortable with finding pulses, then using your fingertips is the most sensitive way to check pulses. Usually, I am just checking whether the pulses are strong and bounding, so I lay my fingers over the whole area. It can be faster an accurate enough on a wiggly horse. Order the Digital Book that is compatible with all tablets and phones.